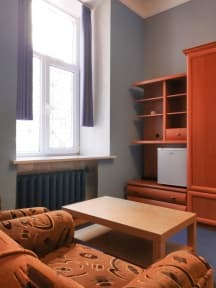 Our fun and exciting hostel is right in the heart of Kiev. We’re situated on the city main street of Kreschatik, just next to Independence Square - always the centre of all main events, performances and free concerts. Can the location be any better? We have a great addition to our hostel. We have Orthopaedic Mattresses in our private room, 8 bed mixed dorm and 8 bed female dorm. Matched with soft comfortable pillows, and modern and sleek comforters you will be sure to get a delightful snooze at our hostel. You will be sure to get one of the best sleeps in the city. In our kitchen we have a fridge, a toaster, a microwave oven, a full set of pans, cups, plates and cutlery. It is a bright place with big windows in every room. We have air-conditioning and fly-screens in our dorms. We have thick comfy mattresses, metal lockers for everybody in the dorm. Clean ironed linens and face towels are included in the price. Nice bed right in the middle of kyiv. People complain about its hard to find and no one is outgoing, which is true. Its an apartment that rents bunkbeds. If you want a resort, go pay for a resort. This is my second time at this hostel and overall I am happy with the cleanness, facilities and the hostel staff, when help is needed they are there! Location is perfect and the price is low, so I would definitely recommend it to budget travelers, just keep in mind to save all your money and valuables in the safe!!! Administrators had their doubts on a guy in my dorm but they never told me this happened before, so that I would be more attentive, because apparently this was not the first time. Not much to say, you get what you pay for. I expected it to be bigger based on how many reviews it had but its actually a smaller apartment. They only have two pans to cook with. The beds were fine and had a curtain to pull over if you need some privacy. There isn't an atmosphere but if you just need a place to sleep it doesn't matter. They only have one shower and bathroom for the whole hostel so keep that in mind. It seemed like the staff also live there and do the best they can. 7/10. Best thing about this hostel is definitely the location! The lane on which it's located is not so hard to find even at night. The two boys at the registry are cool yet a bit unrelated to the hostel it feels a bit as if they're living there and not so concerned with the very operation. The place could take on some cleaning on daily basis for sure! No bedbugs though! Unfortunately bath is still just one and you need to queue to manage on time. Pros: centrally located and cheap. Cons: one bathroom and one shower for 12+ people. The hostel is located down a creepy ally, not good to arrive at night. Small kitchen sitting area mobbed with other guests. No real common area to hang out. I woke up with bites all over my arms. Another guest would keep the light on really late every night. Someone stole money out of my jacket pocket over night (ok there were lockers but none were assigned to my bed #). Overall: not a pleasant experience. If this is supposed to be the best hostel in Kyiv... The beds and rooms are unclean, a lot of pubic hair underneath the sheets, and I got some insect bites There is one (dirty) toilet and one shower for the whole place, so if you’re not one of the first lucky three, the water is going to be freezing cold The staff is rude and unhelpful - one guest refused to take his shoes off (because of the dirty toilet) and was immediately yelled at in all the English curse words the girl knew. Terrible . Just a crowded , dirty apartment full of bunk beds .